If you want to ensure the best possible future for your children—and what parent doesn’t?—then taking proper care of their feet is of vital importance. Their feet need to be tough enough, strong enough, and nimble enough to keep them standing, walking, running, jumping and playing for decades to come. Yet many foot conditions with lifelong consequences can emerge in childhood, or even before birth. Addressing them early can mean the difference between a life of boundless possibility, or a life bound by aching and pain. Unfortunately, feet are often overlooked—or even if they aren’t, parents aren’t always sure what to look for. Here are some tips to help keep a close watch on your little one’s feet as they grow. Webbed toes, or syndactyly. Usually, this is a minor aesthetic concern, caused by connective tissue remaining between the digits rather than “dissolving” in the womb. However, more serious cases may involve fusing of bones. Extra toes, or polydactyly. Being born with more than five toes on each foot happens more often than you might think. The extra digit may be removed for aesthetic reasons or if it interferes with regular development or function. A clubfoot deformity. One or both feet are born severely twisted, to the point where they may look sideways or even upside down. Clubfoot can usually be treated without surgery through repeated stretching, casting, and bracing, but treatment should begin within the first weeks of life. During the first year of life, your child’s feet will grow very quickly. During this time, they should not be wearing regular socks or shoes. Tight footwear restricts natural motion of the feet, which can delay muscle development and even alter a child’s foot shape as they grow. Get a loose-fitting pair of “booties” to keep feet and toes warm when necessary, but otherwise let your child go barefoot. Shoes are not necessary until your child begins walking. Even then, let them continue to go barefoot indoors so they can continue to develop their balance, strength, and coordination without restriction. Shoes should be worn only to protect the feet when walking outdoors. There’s a reason we call them “toddlers.” It takes a lot of time, patience, and development to turn that waddling, toddling gait into a confident, adult-like stride. You shouldn’t expect perfection from day one. That said, do keep a close eye on their walking gait. Many children do not have feet that point straight ahead, but instead appear rotated slightly inward or outward. It may be that the child was “packed” a certain way within the womb and needs some time for their feet or legs to “unwind.” Rotation can vary in severity, occur in one leg or two, and be located primarily in the feet, shinbone, or even thighbone. Most of the time, in-toeing and out-toeing resolve on their own before adolescence—but not always. Furthermore, while “toddling” is one thing, kids who walk with knees knocking together or bowed outward, walk with a limb, walk on their tiptoes, etc. should get a checkup. These problems do sometimes go away on their own. But if they do need treatment, the earlier the better. 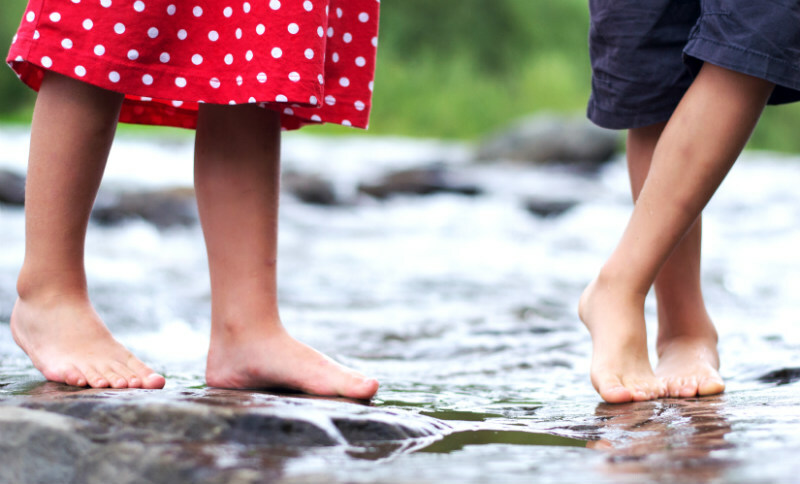 This might surprise you, but most kids have flat feet—at least part of the time. During the first few years of life, the bones remain soft (they actually don’t fully mature until the mid-teens), while the ligaments and tendons that are responsible for giving the arch its shape are relatively weak and undeveloped. As a result, your child’s foot may appear totally flat when they’re staying—even if you can see an arch while they’re sitting or standing on tiptoes. Most kids start to develop a solid, permanent arch by about age 5 or 6, with some a little younger and some a little older. If their feet are still looking flat, or they should any indication that they might be suffering from related pain—limping, avoiding activity, pulling off their shoes, etc.—you should seek further attention. It is possible that your child’s flat feet are caused by a more serious bony deformity or neuromuscular condition and need more aggressive intervention. Kids as young as age 7 and as old as age 15 might start to develop heel pain symptoms very similar to plantar fasciitis, the most common heel pain condition in adults. Often the onset of symptoms coincides with joining a sports team or beginning other forms of more active play. In this case, the problem usually isn’t plantar fasciitis at all, but irritation in the “growth center” or growth plate of the heel bone. This is a softer segment of bone tissue that is exposed during childhood and vulnerable to overuse injuries. The condition is called Sever’s disease, and one way you can test for it at home is by gently squeezing the sides of your child’s heels and seeing if there is any additional pain. Conservative treatments are usually sufficient to treat the condition, but it’s important to visit a podiatrist first for a complete examination and diagnosis. We need to determine whether or not a more serious injury, such as a fracture to the growth plate, has occurred. We want to close with this guiding principle. If their feet are hurting, don’t tell them to walk it off. Take it seriously. Get it checked out. It is far too easy for a simple sports injury or structural imbalance in the foot to develop into chronic problems if you don’t get your child the care they need. If your child isn’t able or willing to talk to you about their injury, look for the telltale signs. Limping. Pulling their shoes off after only a few minutes. Shying away from running or physical play. Always asking to be carried. These could all be subtle indications that a foot problem is brewing under the surface. If you want effective children’s foot care from an experienced doctor you can trust—and again, what parent wouldn’t?—give Dr. Harvey Danciger, DPM a call today at (760) 568-0108 to schedule an appointment.